Our MongoDB Tests allow you to experience an online examination in the real-time environment. In every online test on MongoDB, you will be presented with Multiple Choice Questions (MCQs) which will test your skills in MongoDB Concepts in a detailed and comprehensive manner. In the test, each question will have 4 options to choose from. You should select only 1 correct option as an answer and then move on to the next question. Once you submit answers to all the questions, you will be given your final test score. In the Online MongoDB Test, for every correct answer, you will be given 2 points. There will also be negative marking of -1 for every wrong answer. So, you will have to be more careful in choosing the answers to the question in your online examination. If needed, you should skip to the next question and come back to the previous question later so that you can do proper time management for the online mock tests. 1. "MongoDB Practice Tests" - In MongoDB practice tests, there will be a series of practice tests wherein you can test your MongoDB concepts on every chapter separately. There will not be any time limit on these tests. So, MongoDB Practice Tests should be the first set of tests which you should attempt. Goto these practice tests here. 2. "MongoDB Mock Tests" - In MongoDB mock tests, there will be a series of mock tests wherein you can test your MongoDB concepts on every chapter separately, but there will be a fixed time limit per test. So, it is similar to MongoDB Practice Tests, but with an added constraint of time limits. 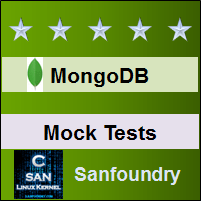 You should try MongoDB Mock Tests if you are appearing for any online examination soon. Goto these mock tests here. 3. "MongoDB Certification Test" - Once you are through with your MongoDB concepts, then you should try our MongoDB Certification Test wherein Sanfoundry will issue a free Certificate to you if you scored either Grade A* or Grade A in MongoDB Certification Test. Goto MongoDB Certification test here. 4. 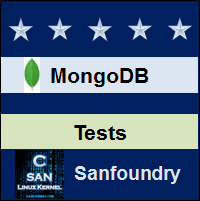 "MongoDB Internship Test" - If you are interested to do Internships in MongoDB at Sanfoundry, then you must take our MongoDB Internship Test. 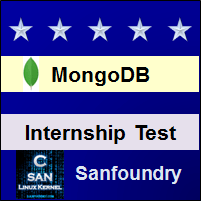 If you scored either Grade A* or Grade A in MongoDB Internship Test, then you are eligible for Internship at Sanfoundry in MongoDB. Goto MongoDB Internship test here. 5. "MongoDB Job Test" - If you are a fresher, a dropout, an experienced person and if you know MongoDB well and looking out for jobs in MongoDB domain at Sanfoundry (or our Network of Companies), then you should try and qualify our "MongoDB Job Test". 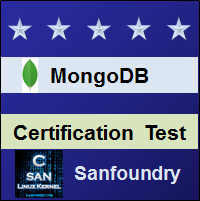 If you scored either Grade A* or Grade A in MongoDB Job Test, then you are eligible for a Job at Sanfoundry (or our Network) in MongoDB domain. Goto MongoDB Job test here. For every "MongoDB Practice Test", Total Questions: 20, Total Time: Unlimited. For every "MongoDB Mock Test", Total Questions: 20, Total Time: 20 Minutes. For "MongoDB Certification Test", Total Questions: 50, Total Time: 1 hour. For "MongoDB Internship Test", Total Questions: 50, Total Time: 1 hour. For "MongoDB Job Test", Total Questions: 50, Total Time: 1 hour. Before you get started on these series of online tests on MongoDB, you should learn, study and practice our collection of 1000 MCQs (Multiple Choice Questions and Answers) on MongoDB here. We also prefer that you should practice MongoDB practice tests and mock tests completely before attempting the certification test. Here is the list of online practice tests and mock tests on MongoDB. Each online test focuses on a "Specific chapter of MongoDB". So, you should try both practice test and mock test on every chapter to do a self-assessment of your knowledge (along with time-limit constraints) in every area or sub-topic of MongoDB. MongoDB Certification test, Internship test, and Job Test are mentioned at the end of this list. 1. MongoDB Test 1 – This set of online test on “MongoDB” tests your skills on Introduction to MongoDB, Big data and MongoDB, NoSQL Databases, Installation-1, Installation-2, MongoDB Enterprise-1, MongoDB Enterprise-2, MongoDB Packages, Getting Started with MongoDB-1, Getting Started with MongoDB-2. 2. MongoDB Test 2 – This set of online test on “MongoDB” tests your skills on Generate Test Data, CRUD Concepts, Read Operations-1, Read Operations-2, Write operations-1, Write operations-2, Analyze Query Performance, Data Modeling Introduction, Data Modeling Concepts-1, Data Modeling Concepts-2. 3. MongoDB Test 3 – This set of online test on “MongoDB” tests your skills on Data Model Examples and Patterns, Model Tree Structures, Model Data for Atomic operations, Model Monetary and Time Data, GridFS, BSON, ObjectId, MongoDB documents-1, MongoDB documents-2, MongoDB Administration. 4. MongoDB Test 4 – This set of online test on “MongoDB” tests your skills on Operational Strategies, MongoDB Backup, Monitoring for MongoDB, Run-time Database Configuration, MongoDB Maintenance, Production MongoDB, Data Management, Operational Segregation, Capped Collections, Data from Collections. 5. MongoDB Test 5 – This set of online test on “MongoDB” tests your skills on Optimization Strategies-1, Optimization Strategies-2, Optimization Strategies-3, System Collections, Database Profiler, Exit Codes and Statuses, Authentication, Authorization, Collection-Level Access Control, Network Exposure and Security. 6. MongoDB Test 6 – This set of online test on “MongoDB” tests your skills on Security and MongoDB API Interfaces, Auditing, Kerberos Authentication, Security Checklist, Access Control, User and Role Management, Aggregation, Aggregation Pipeline, Map-Reduce, Aggregation Operations. 7. MongoDB Test 7 – This set of online test on “MongoDB” tests your skills on Aggregation Mechanics, Pipeline Optimization, Pipeline Limits, Pipeline and Sharded Collections, Map-Reduce and Sharded Collections, Pipeline Operators-1, Pipeline Operators-2, SQL to Aggregation Mapping Chart, Aggregation Commands and Variables, Indexes In MongoDB. 8. MongoDB Test 8 – This set of online test on “MongoDB” tests your skills on Index Types-1, Index Types-2, Index Types-3, Index Properties, Index Management, Geospatial Index, Text Search, Indexing Strategies, Indexing Methods, Replication in MongoDB. 9. MongoDB Test 9 – This set of online test on “MongoDB” tests your skills on Replica Set Members, Replica Set Deployment Architectures, Replica Set High Availability, Read and Write Semantics, Master Slave Replication, Replication Processes-1, Replication Processes-2, Replication Maintenance, Troubleshooting, Member Configuration. 10. MongoDB Test 10 – This set of online test on “MongoDB” tests your skills on Sharding Introduction, Sharding Concepts, Cluster Architectures, Sharded Cluster Behavior, Sharding Mechanics, Cluster Deployment, Sharded Cluster Maintenance, Troubleshooting Sharded Cluster, Sharded Cluster Data Management-1, Sharded Cluster Data Management-2. 11. MongoDB Certification Test - This set of online free certification test on "MongoDB" tests your skills on all areas (all chapters, topics and subtopics) of MongoDB. 12. 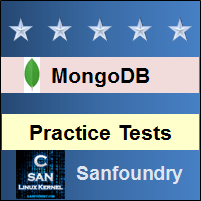 MongoDB Internship Test - If you scored either Grade A* or Grade A in our MongoDB Internship Test, then you can apply for Internship at Sanfoundry in MongoDB. 13. 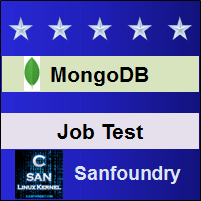 MongoDB Job Test - If you scored either Grade A* or Grade A in our MongoDB Job Test, then you can apply for Jobs at Sanfoundry in MongoDB domain. Best Wishes for your MongoDB Tests!